Below is our most recent laboratory report (4/12/18). With each importation, we demand a lab report for that particular shipment, not one made three years ago. 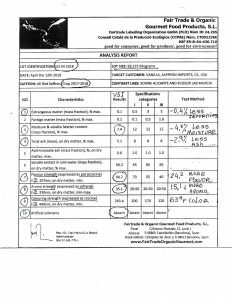 If you ask most importers, they do not know what a photospectometry report is. In order to protect yourself, and make sure that your saffron is pure, safe and of excellent quality, you must have a photospectometry report, like the one you see here. We have one report for each importation, covering color, aroma, flavor and cleanliness. This lab report is done using the testing standards set by ISO, the International Organization for Standardization. ISO Certification must be done by a third party. The test results show the coloring strength of the saffron, and the consumer must be provided with this information. If the coloring strength is not indicated on your tin container, or in your blister, your saffron is no good and you are not protected. Vanilla, Saffron Imports was the first importer to abide by ISO via third party certification and to inform and educate the consumer on this most important issue. Now all Spanish exporters talk about ISO, but none, and I mean NONE of them complies, meaning they are not inspected by an ISO third party. If they were, all of them will be out of business, because they would have to state and print on their containers, the coloring strength of their saffron. This is the only way YOU, the consumer, can be protected. Everything else is bs (bad saffron). In our opinion, without a lab report by an ISO certified third party,”Standard Saffron”, “Mancha Saffron”, “Selecto Saffron”, “Hand-Picked Saffron”, “Artisan Saffron”,”Denomination of Origin” or “Denominacion de Origen”, “Superior Saffron”, are just empty words. 1. Floral Waste: This is the maximum amount of flower material allowed in the saffron. 2. Foreign Matter: The maximum allowed for Category I is 0.1% . Ours is 0.1%, which makes it pharmaceutical grade in cleanliness. It means that it has been shifted at least seven times, thus eliminating pollen, dirt, “gravel”, insects, insect parts, etc. 3. Moisture and Volatile Matter: The maximum percentage allowed is 12%. Ours is 7.4% . This is one of the most important characteristics of saffron, and the one that is most abused by packers/exporters, because it is here where most of the cheating is done, affecting the coloring strength (see No. 9 below) and the overall quality of saffron. A) When the yellow part of the saffron stigma is left attached to the red part, moisture is trapped and the saffron becomes musty. This is why many writers describe the aroma of saffron as “musty”, a smell which is not the true aroma of saffron. You get aroma when you cut out the yellow so that no moisture remains. B) If the yellow–which has no culinary value–is left attached, it increases the weight of the saffron by at least 25%, plus another 6% from the trapped moisture. C) Moisture decreases the flavor, the aroma and the shelf-life. D) The yellow part must be removed before saffron is dried,and this is what used to be called in Spain “Coupé”, and in Iran, Sargol, meaning the “top of the flower”, detached from the yellow. In the early 1900’s French Chefs will only buy the red part, even though they didn’t have photospectometry, they knew that this is the only part of the stigma that has saffron. Like them, you should only buy all-red saffron. Saffron that has to be “dried” or “toasted” on a pan, is no good saffron. When the saffron has yellow, it is soft and spongy to the touch. When saffron is properly dried and cured, like our Sargol or Pushali, all-red, it is brittle the touch and you can crush it in your fingers. 4, 5 and 6. These parameters must be below the maximum allowed for Category I saffron. As you can see, our results are far below than the maximums allowed. 8. Safranal: Safranal gives saffron its aroma. Again, our saffron is 35.1, 15 points above the minimum. 9. Crocin: Saffron color derives from Crocin. This is the most important value because a high degree of coloring strength can only be obtained by cutting out the yellow, thus making the saffron all-red. This is why every package of saffron must indicate the coloring strength, because it is the only way for you, the consumer, to know the quality of the product you are buying. Again, the higher the coloring strength, the better the saffron. Ours is 263.4 ISO for Category I is 200. We are 63.4 above the regulation. 10. Artificial Water-soluble Acid colorants: This is why you need a lab report by an ISO certified exporter. Saffron adulteration has always been a problem, and it may be very hard to detect, even to the expert eye. Claims of origin do not guarantee that it is not adulterated, therefore, you must ask for a report, even if you only buy one gram. For example Spain, who produces only up to 800 kilos, is shipping to the US alone 20-25 metric tons per year. How they do this is a mystery to me. Again, an ISO certification from a third party–not from a “self-regulated” association–is essential to protect you, the consumer.